The Centre for Women & Trans People operates a collective for volunteers to get involved in events, campaigns, advocacy and maintaining the drop-in space. This space is reserved solely for students who self-identify as women and/or trans. 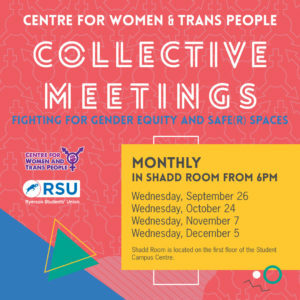 This event is open to all women identified who abide by the RSU Equity Statement. The centre is a pro-choice space and pro-reproductive justice space.